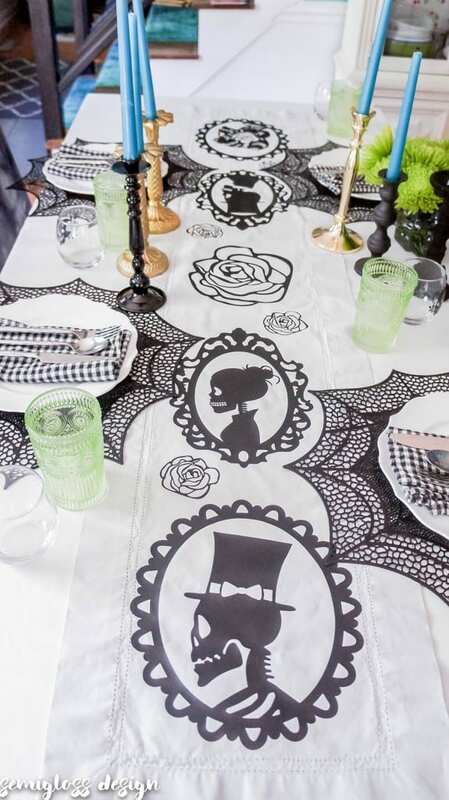 Recently, my friend, Ariel from PMQ for two asked if I wanted to join a Halloween tablescape and I jumped at the idea! I love decorating for fall, but since we moved to the middle of nowhere and don’t have trick or treaters, we don’t decorate for Halloween anymore. 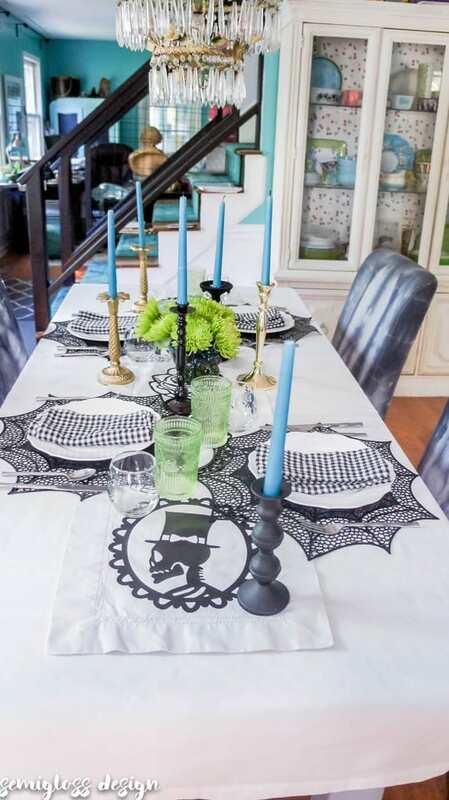 My kids are always thrilled when I set the table fancy, but a Halloween tablescape would really delight them. It’s not a secret that I love color. But orange is generally not one of those colors. So, I tried really hard to stick with blacks, whites and grays. It looked unfinished though, so color was added! 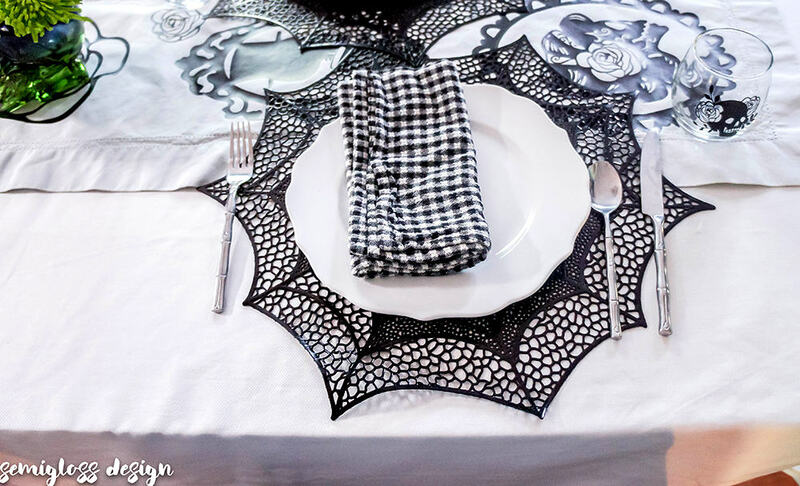 I found spiderweb placemats at my local grocery store (Wegman’s if you’re curious) and went from there. 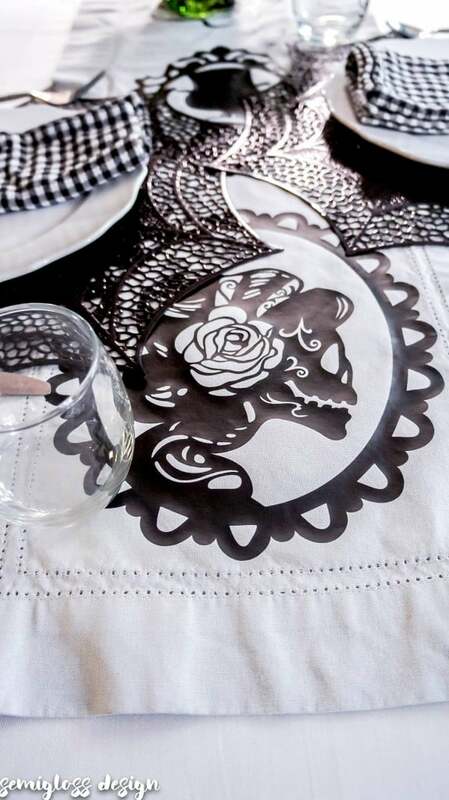 My table has a walnut top, so I layered it with a white tablecloth to make the placemats show up. I used my normal white dishes and bamboo silverware that kind of looks like bones with a little imagination. Then I added in a runner to add more pattern. I had a vision of skeleton cameo silhouettes. I made the runner with heat transfer vinyl that was very kindly provided by Craftables and deserves it’s own post entirely. Spoiler alert, I LOVE this htv!! Tutorial here. 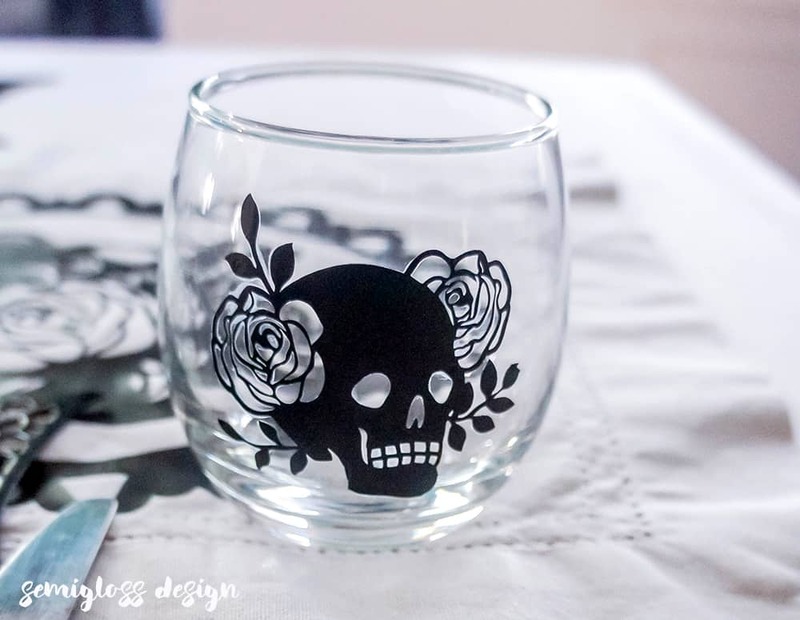 I used the heat transfer vinyl on some glasses as well. Probably not a project for the faint of heart, but I’ll do a full post on that too. The glasses aren’t perfect, but they did turn out super cool. Let’s move on to pretty pictures! Be sure to check out these incredibly stylish ladies!! Previous Post: « How to Install Pegboard Like an Expert! 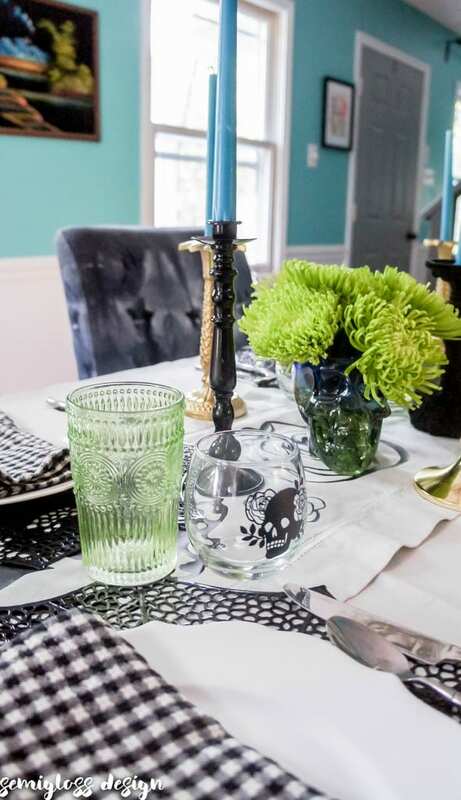 Emy, your black and white table is so festive, and the pops of blue and green make it so much more fun! I pulled my bamboo flatware out because I thought it could pass for “bones” too! 😉 Your table looks fantastic! Thanks Jennifer! It was such a fun blog post to put together! 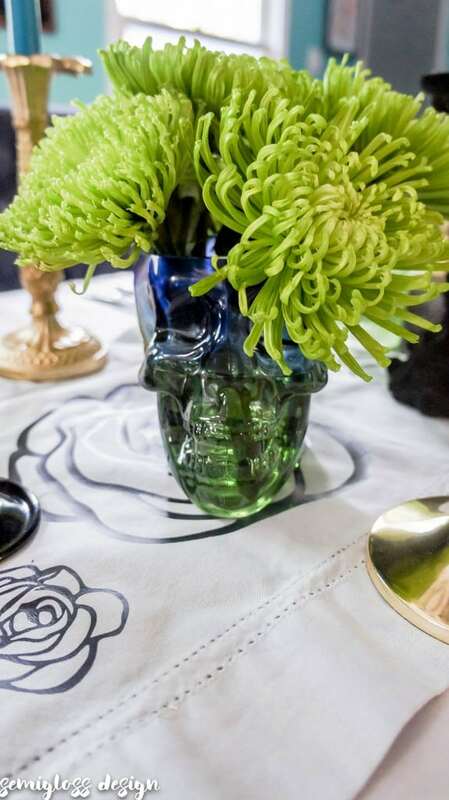 I love love love all the skulls! Super fun! The blues and greens are a lovely touch as well. Thanks Ariel! It was so much fun to put together! Thanks for inviting me to play! 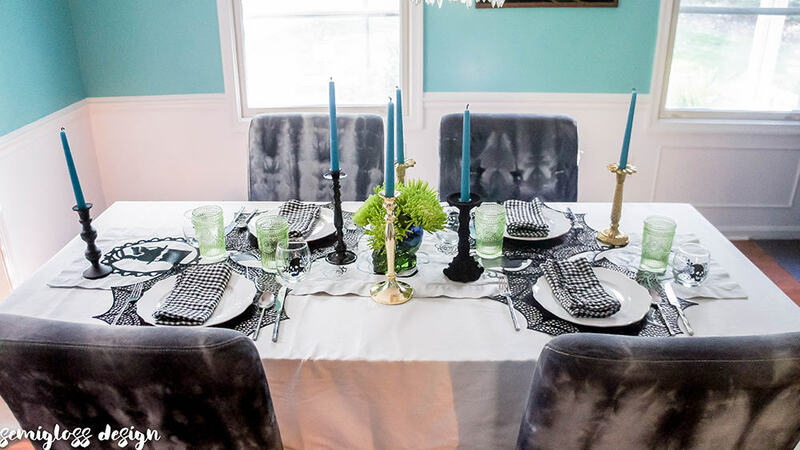 I’m loving all of the DIY decor you’ve incorporated! 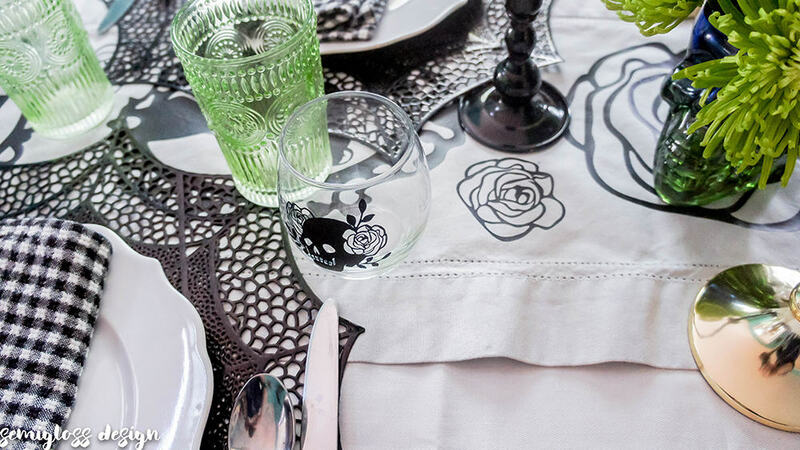 They really bring this beautiful tablescape to life! 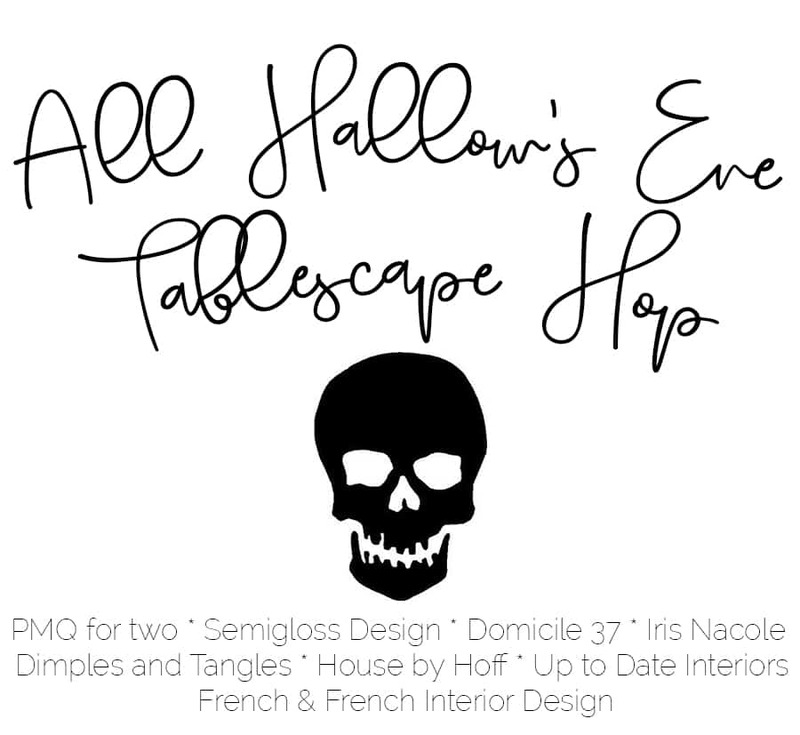 So my brain is on halloween and in the “tablescape” graphic i read “apocalypse.” haha!!!! loving your mix of blues and greens and black and white! those green mums are awesome! That’s a whole different kind of dinner party. Don’t drink the kool-aid. Seriously, don’t. 🙂 The mums are from Wegmans. This so beautiful Emy. The simplicity of the color choices make the room appear even more elegant. 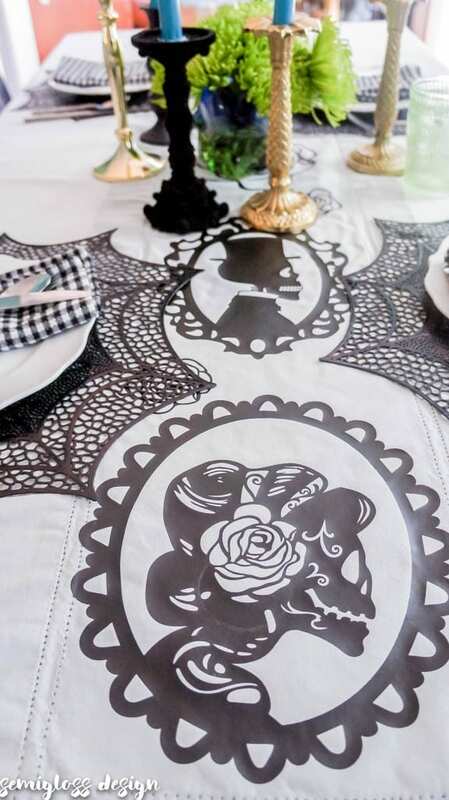 Your DIY runner is amazing and so creative!! 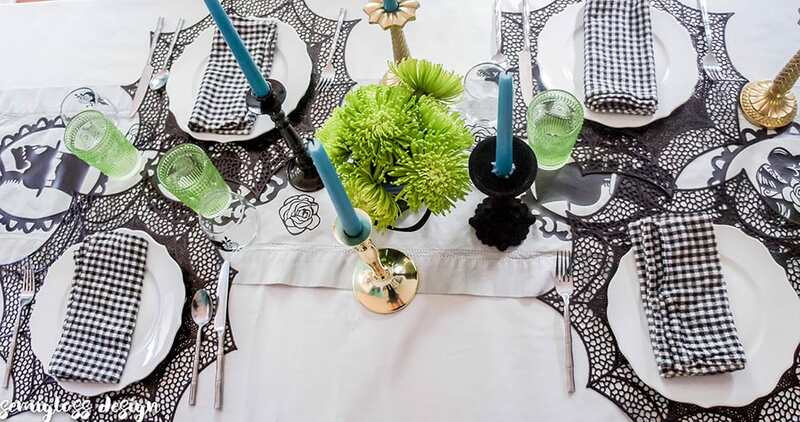 Lovely and classy table with non traditional pops of color. Love it! What a super fun table! Really creative! 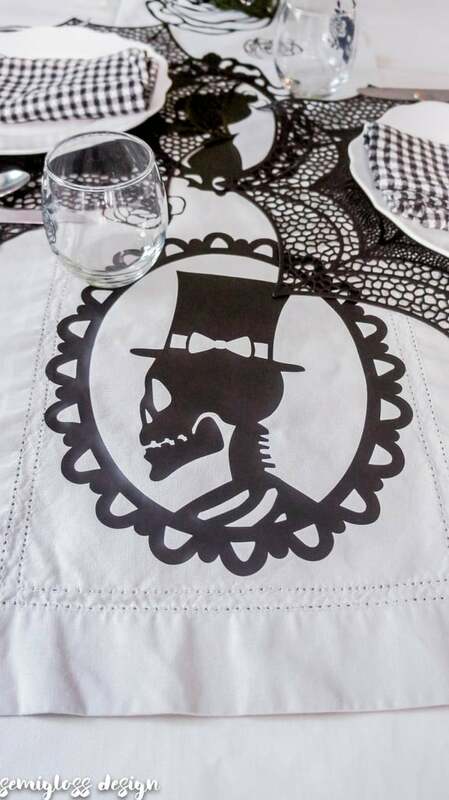 That table cloth!!! Thanks Heather! I loved being part of this blog hop!